Because it made me realise how good the BM is. I really like the look of the Z and given that the base bike is a modern z900 I expected it to be very good dynamically. I reality it felt unsophisticated, cheap and "old". The clutch is very light, which I guess some may like, but to me it just removed any feel making me feel like a learner driver each time I was pulling away, I guess it's something you'd get used to and after an hour I was better but still not perfect. I know this bike doesn't have a QS but that's no excuse for a gear change which felt "agriciltural" at best. OK in the upper gears but using 1-3 around town was a chore and something I'd avoid. Worse still was a power delivery which resulted in the feeling that the driveline had masses of backlash. 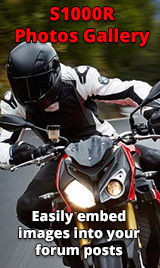 Back off the throttle (like when entering a bend ) then ease it back on results in nothing for an instant followed by the power coming in with a bang which then upset the handling. I'm not sure that would reduce with practice, but why should I have to? I didn't with the BM. In short a bit (lot) dissapointing as I like the looks of the bike but equally put a smile on my face when I got back on mine. Fuel cut off is standard on all modern FI bikes. Only BMW is able to work around it and smoothen the fueling. Aye, but the fact that BM can work around it does mean it's work-around-able so why don't others get their acts together? Smoothness is one of the reason I went for the s1kr. It's smooth at any rpm, makes it really nice in slow residential streets. No jerkiness whatsoever compared to my vfr800. You can also be in any gear at any speed and in any gear and not have to shift because it's jerky like my friend's rc8. It must be a difficult problem to overcome because not many seem to do it! I definitely miss the smooth fueling of the S1KR. My Tuono is pretty bad anything below 4K Rs. It even has a light telling you you should down shift. The beemer would have handled this situation fine. I'm on my second 1600. BMW has not mastered it on that bike. I've now had five bikes with ride by wire. The Panigale is virtually perfect. My Sperduke GT and the S1000R I had are very good. The 1600s are not even close. But with close to 60,000 miles combined on the two 1600s I've learned to work with it. Thats strange. I have never rode a jerky BMW. Whats the fix? Flash and fuel controller? If you are going to do that keep the garage door closed. Wouldn't do to upset the neighbours!